The first 3D first person shooter computer game I can remember playing was Wolfenstein 3D. This papercraft Tesla gun comes from the 2001 remake of the game, Return to Castle Wolfenstein. In both games the storyline involves an American soldier who attempts to escape from an underground Nazi research facility during World War 2. The Tesla gun comes in handy in the escape attempt as it fires bolts of electricity that fry enemies. 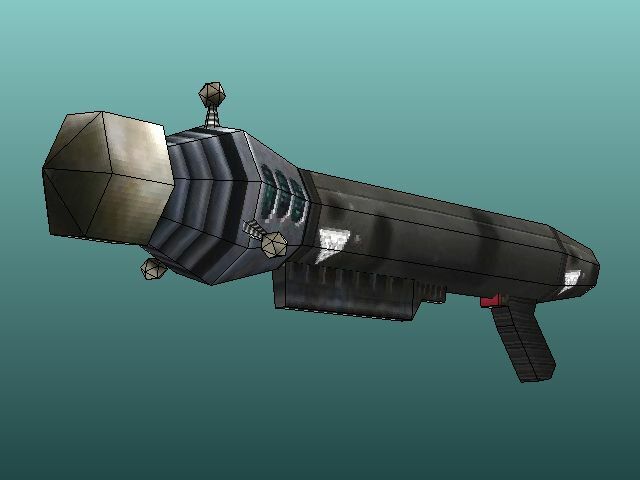 This scaled down papercraft model of the gun was created by German industrial design student, Jan Kapischke. A template may be downloaded here. Toad is a character who has appeared in numerous Nintendo video games. He lives in the Mushroom Kingdom and is one of Princess Peach's most loyal servants. 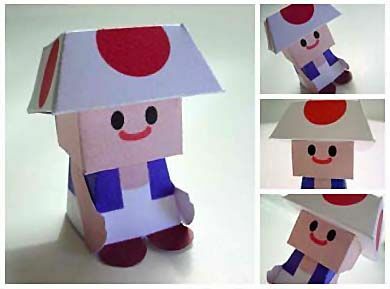 This paper toy Toad was originally posted on a Japanese website as late as 2006, but sadly the web page is no longer up. Fortunately, Denise at the "Oh! Crafty Me" blog has a copy available for download. Go to her page here and look for the link near the bottom of the page to get the template. 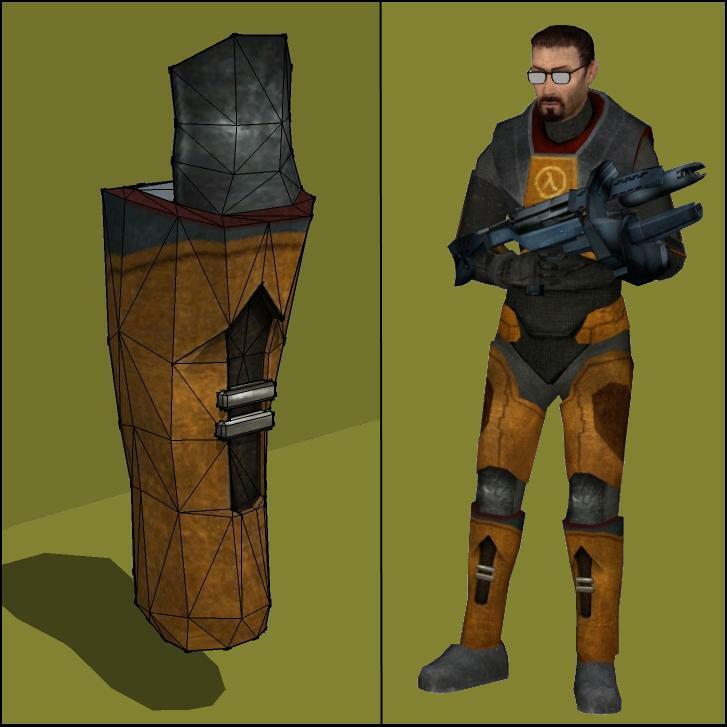 The template for the shin armor is based on the right leg of a 3D model from the game. The paper model is symmetrical enough that it can be worn on either leg, but if anyone is a stickler for detail and would like a reversed template for the left leg, send me an e-mail request. I tried on the test build of the shin armor and it was almost an exact fit. However, I am 5'11" (180cm) tall, so someone of a different height may need to modify the template in order to get it to fit correctly. 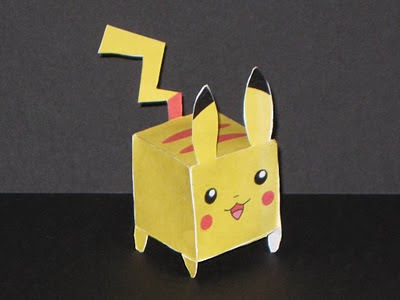 Here is another papercraft by Moustagua. Once again based on the Saint Seiya anime series, this is a papercraft statue of the Greek goddess Athena. 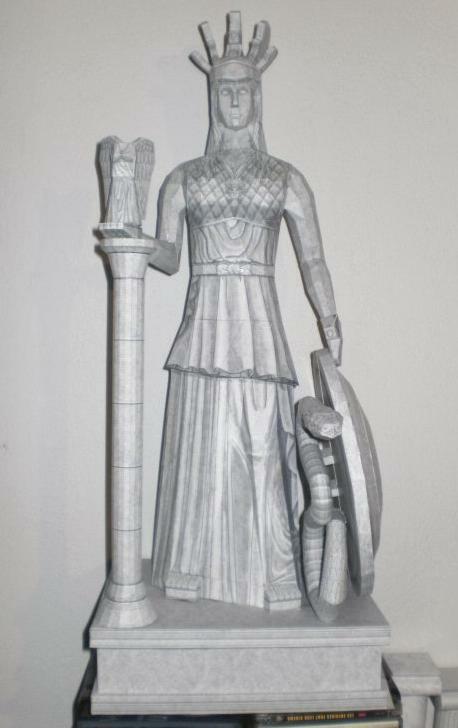 In the series, Athena is assisted by warrior "saints" in her struggles against the other gods. 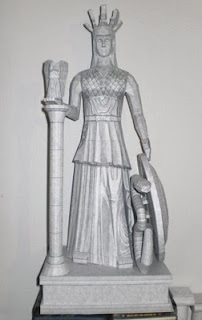 This papercraft model appears to be heavily based on the real life gold and ivory statue of Athena that once stood inside the Parthenon in Athens. On the column is the traditional Greek winged symbol of victory and behind Athena's shield is a snake which is a symbol of Erichthonius, who legend has it was one of the early rulers of Athens. A PDF template of the statue may be downloaded here. The Saint Seiya anime television series was popular around the world in the late 80's but wasn't aired in the US until 2003. Based on a Japanese manga series, the storyline of the show follows the exploits of mystical warriors called "saints" who fight for the goddess Athena in her struggle to protect Earth from other gods in the Greek pantheon. In the "Asgard" story arc of the show the saints encounter characters from Norse mythology. 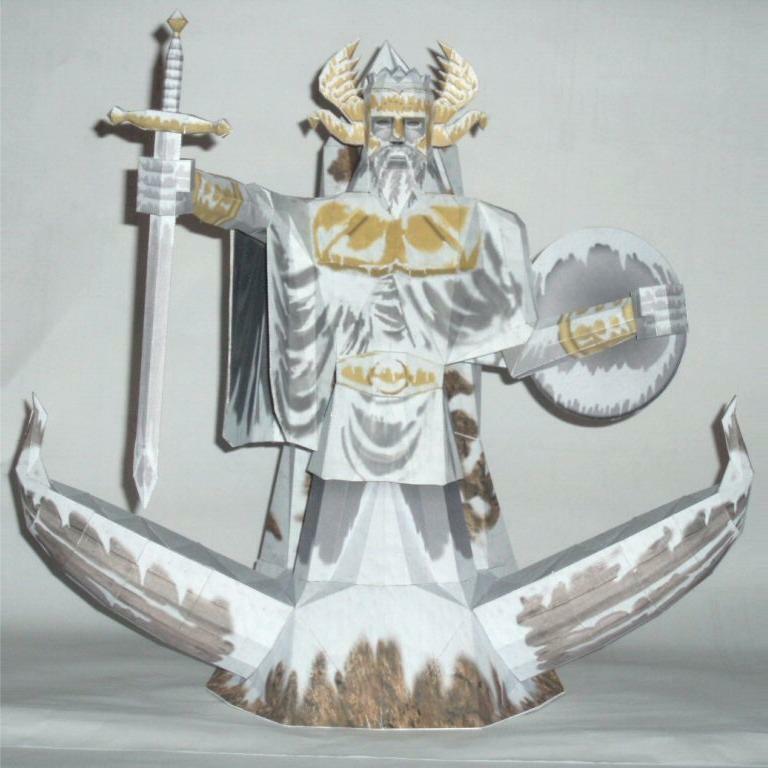 This papercraft Odin statue by French papercrafter, Moustagua, is presumably based on an image from this particular story arc. Odin is king of the Norse gods much like Zeus is in the Greek pantheon. With instructions in French, the PDF template may be downloaded at the bottom of Moustagua's page here. 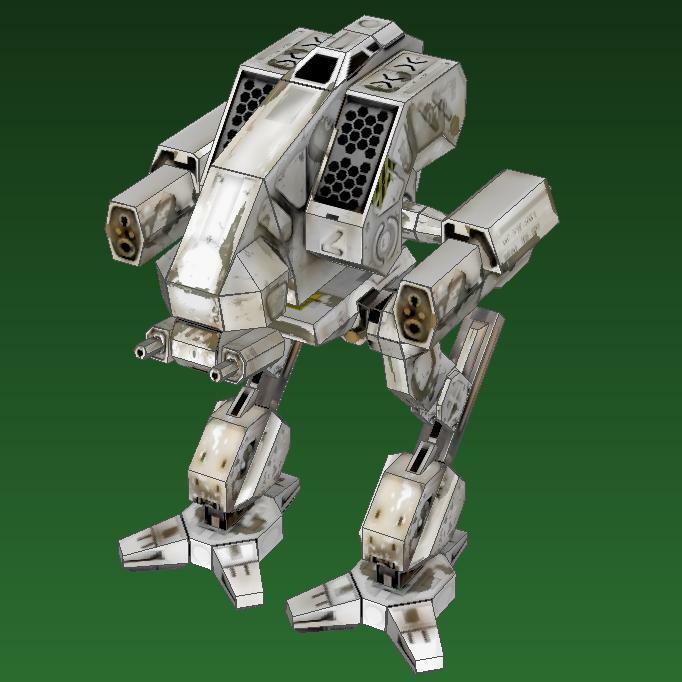 Here is another fine MechWarrior 4 papercraft from the folks at the Mech3.org forum. In the MW4 universe this battle mech got tagged with the name "Vulture" due to its hunched shoulders and protruding head which are reminiscent of its namesake. This 1:40 scale papercraft is the work of forum member, Shiftdel and may be downloaded here. The template is available in Pepakura PDO format only. 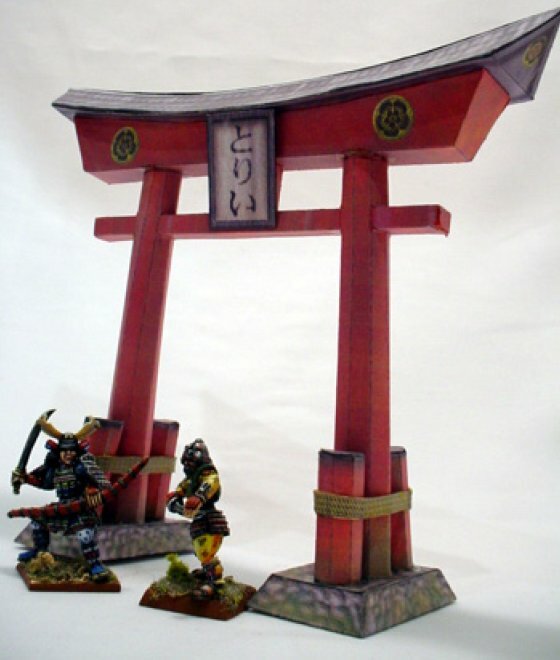 This papercraft torii was created for use as a prop in samurai related miniature gaming, but I think it is a nice model in and of itself. A torii is a symbolic gateway that indicates the division between sacred and profane space. In Japan, torii similar to this one are typically seen at the entrances of both Shinto shrines and Buddhist temples. This papercraft was created in 2004 by Paul Lesack. A download of the template for the torii can be found near the bottom of the page here. Back in 1979 Disney tried to cash in on the Science Fiction movie craze caused by Star Wars and the result was The Black Hole. 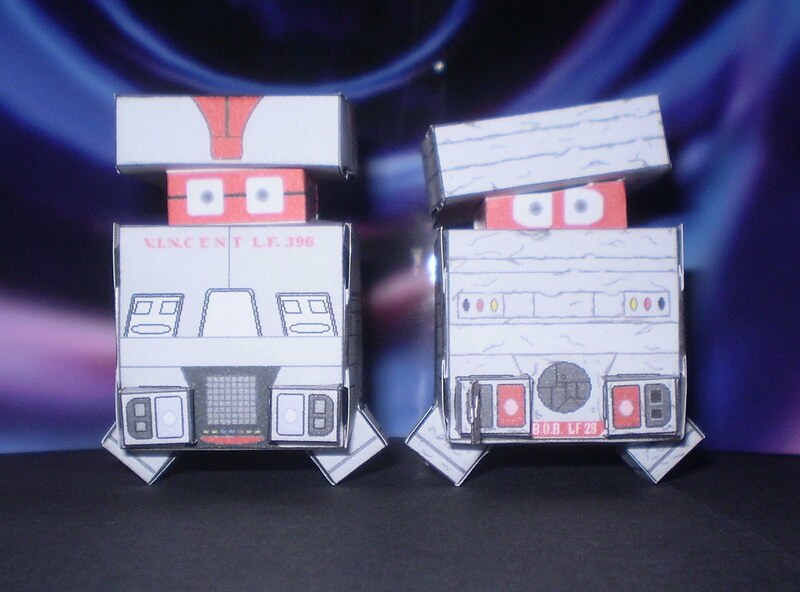 These two hovering robots known as V.I.N.CENT and B.O.B are from that movie. Another fine couple of sci fi papercraft by Cyberdrone based on the glue-less Cubee template, they may be downloaded here and here. There has been a lot of nice papercraft models created from the 3D models in the World of Warcraft MMORPG. 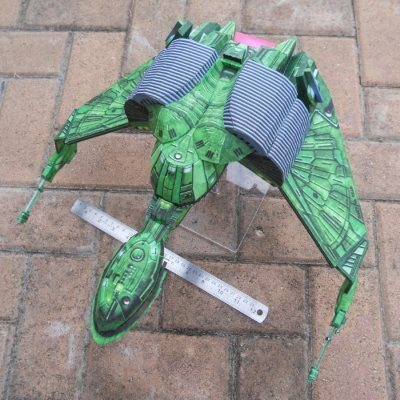 Here is one more to add to the list: a papercraft of the Grand Marshal's Aegis. 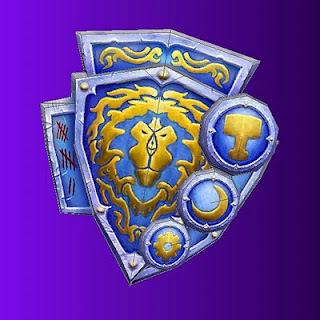 According to Merriam-Webster's dictionary, the word "aegis" is of Greek origin and is defined as "a shield or breastplate emblematic of majesty". This model was created by Czech papercrafter, Goozi and the PDO template may be downloaded from his website here.